It's Halloween weekend! That means Julia and I can finally reveal our costumes, which are Toy Story-themed: she is going as Jessie the cowgirl, and I'm going as Woody! We gave our costumes a test-run last weekend at a Halloween bash thrown by a local real estate agency. Finally, here's a video of Julia and me at the party. Julia kept reenacting the scene in Toy Story 2 where Woody rescues Jessie. It was sure was fun to rescue her! Julia and I hope you all have a Happy Halloween, and I'm sure we'll have lots of trick or treating photos to share with you next week! I love to draw things, and Henry has started to feel the same way. Good thing we have an easel for two, which means we can both work at the same time. One side has a dry-erase board; the other side has a chalkboard. Sometimes Henry likes to use the chalk; other times he just wants to walk around with the eraser and run in circles. When we want to Wightman's Farms last year right before Halloween, I was so little that I pretty much just slept and cried the whole time while Julia had all the fun. But this year, I had a ball right along with her. First thing we did was go on a hayride around the property. Then we went to the pumpkin patch, where I picked my own pumpkins. Later on, we played in the corn pit, which was like a sandbox filled with corn instead of sand. Julia then climbed to the top of a big pile of pumpkins. I was so jealous that she got to do that! 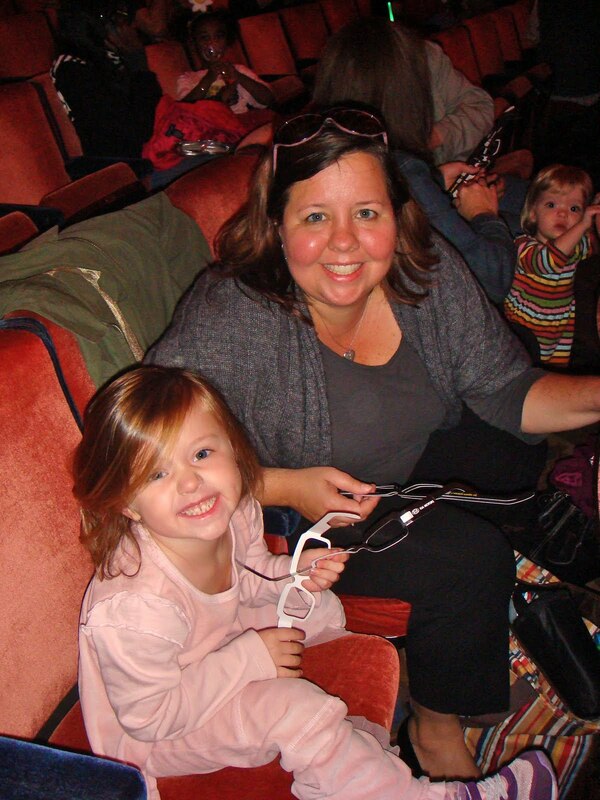 Next year, I'll be sitting right up there along with her! It's my 17-month birthday today. I'm trying to shake yet another ear infection, but hopefully I'll still be able to make it out to the other Halloween festivities that I hear are planned for the weekend. It's almost Halloween, which means it's time to start dressing up and frightening people. With the dinosaur mask I got at Alec's dino-themed birthday party over the weekend, I've been working on my roar. Scary as that was, it doesn't hold a candle to what happened last night when I was downstairs by myself while Dad was putting Henry to bed. Suddenly, a bat - yes, an actual bat! - flying around the house. It was pretty traumatic (for Henry too, who got upset when he saw how hysterical I was), but we're okay now. Yikes! I definitely prefer to scare other people, as opposed to being the one who gets scared. I'm so proud of myself. Anyone can walk forwards, but how many people can walk backwards? I'm pretty sure that I'm the only person who can! I figured it out a couple weeks ago, and few things make me as happy as showing my new talent off to people. Speaking of new talents, this video of me walking backwards also shows how I've learned to properly dispose of pipas after I'm done with them (thanks Babcia and Dido, for showing me how to put them in the sink). Did you notice my cute new slippers to wear around the house? Mom just got them for me; they make me so happy! How do you like them Applegate's? I guess I have a little more work to do on my beanbag tossing! Mom and Dad had a special treat for Julia and me about a week ago: they took us to Radio City Music Hall in New York to see a live stage show of one of our favorite TV shows, Yo Gabba Gabba! 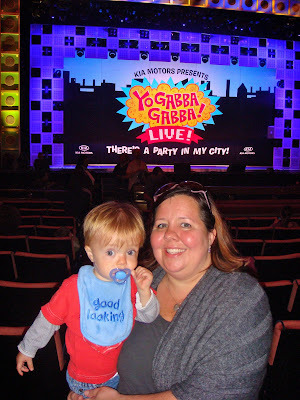 We had great seats and were very excited as we waited for the show to start. Before it began, Julia clowned around, trying to shove her whole hand in her mouth. Then the show started, and I was riveted. There was so much fun stuff to watch on stage. Look: balloons, my favorite! After this, hundreds of balloons dropped from the ceiling. I was in heaven! 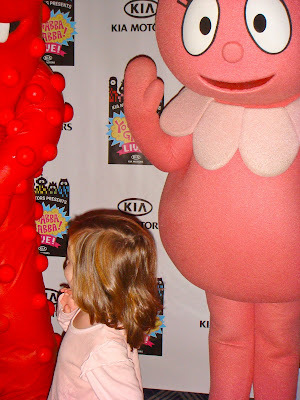 After the show, we went downstairs and waited in a looong line for the chance to meet all the Gabba characters. Here I am giving a hug to my favorite one, Brobee. 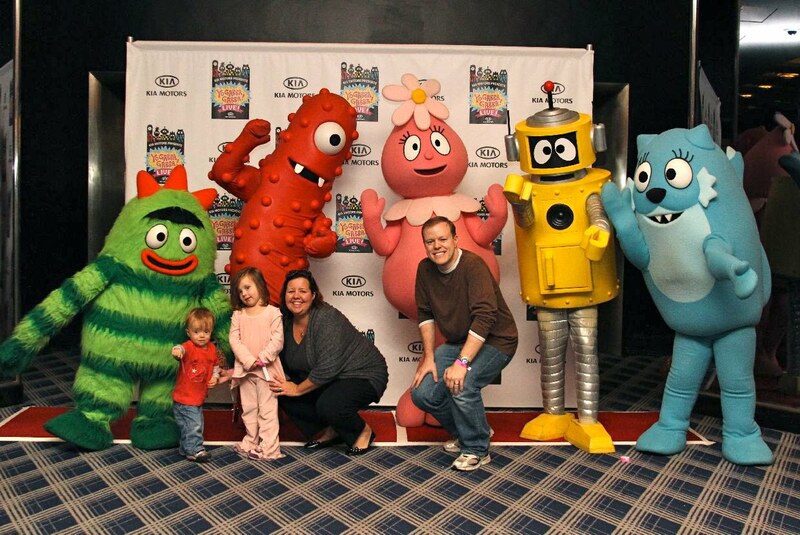 Finally, here's the photo of all of us with (from left) Brobee, Muno, Foofa, Plex and Toodee. What a great show! Yooooooooooo Gabba Gabba! It's been a great week to be a Jets and Yankees fan (and a bad week to be rooting for Minnesota sports teams!). The Yanks swept the Twins to advance to the ALCS (putting themselves one step closer to "getting the trophy," as I like to put it), and last night the Jets beat the Vikings on Monday Night Football. Our Sesame Place week comes to an close with a few odds and ends. As I've mentioned previously, I'm not a fan of wearing barrettes these days. While we waited for the parade, I demonstrated one reason why: when I'm not wearing any barrettes, it makes it much easier to flip my hair! And that's it for this year's Sesame Place coverage. Have a good weekend, and next week we'll return to our regularly scheduled blogging. Look for one final Sesame Place post tomorrow. And last but not least, Zoe!